Since its release two years ago, the iPad has always needed a better Twitter client. Tweetbot for iPad is the better Twitter app I have been waiting for, and it sets a new standard that future Twitter clients will have to be compared with. From a Twitter power user’s perspective, the iPad came at an interesting point in the history of the platform. Twitter clients for iPhone and Mac had reached a kind of maturity and complexity that enabled users like me to demand a certain grade of efficiency from new Twitter apps for the tablet; Twitter itself was beefing up its first-party app portfolio with acquisitions and a fresh strategy based on making the official clients the go-to apps for the average Twitter user. Some notable Twitter clients came out on the iPad throughout 2010, including the excellent Twitterrific, which we have reviewed several times on MacStories. In 2010, Twitter also released its very own application for the iPad; developed by Loren Brichter, the man behind Tweetie, Twitter for iPad launched to a (still ongoing) controversy as to whether iPad interfaces should adopt more courageous designs in displaying information and sections to the user. Taking the best features of Twitter for iPhone (fluidity, clean design, pull to refresh) and mixing them up with new interaction schemes such as panels and pinch gestures, Twitter for iPad collected rave reviews and considerable disapprovals because of its interesting use of classic Twitter elements (vertical timeline, separate section for Mentions) alongside a new model for driving users' taps around the app in the form of sliding panels, modal menus, and popovers. You can read more about it in my original review from 2010. The problem with Twitter for iPad, I believe, is that it failed to appeal power users in the long term, stalling on the same feature set it had at launch without adding substantial improvement over what could have been a fantastic application. I, for one, used the official Twitter iPad app for months, but then I came at a point where I couldn’t stand seeing decent third-party apps staying on top of new Twitter functionalities and “unofficial” services, and Twitter’s own app left behind with Brichter gone and seemingly no interest from Twitter’s mobile team in keeping it up to date – fixing the bugs and annoyances that were reported on day one. Some improvements and new features eventually found their way to the app, and word is that we are waiting for a major 4.0 redesign of the client which, I believe, will put the app on par with the disastrous iPhone version. Tweetbot for iPad thus arrives in a landscape with no clear leader, but with some very good apps that have caught the attention of both power and average users in the past two years. I wrote about this before. I wish third-party developers would accept Tweetbot as the de-facto app for power users and move on to innovate on other areas of the service. I'm biased: I love Tweetbot, I use it every day on the iPhone, and I couldn’t wait for an iPad version to be released. Today is kind of a dream come true for a Twitter nerd, but the question is – was it worth the wait? 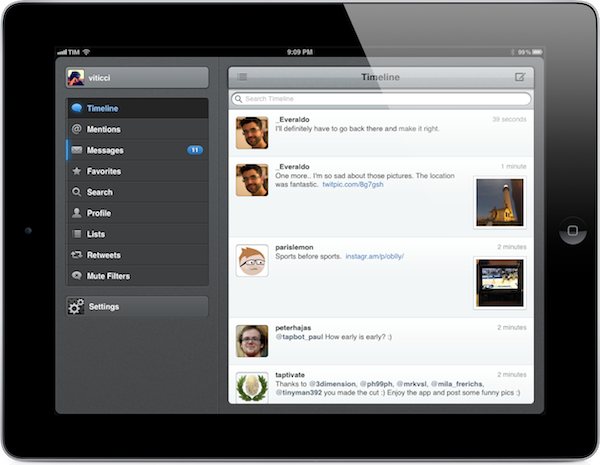 Not just good – is Tweetbot the great app the iPad was waiting for? Let’s dive in. Long story short: yes, it is. Tweetbot for iPad is an amazingly advanced and full-featured Twitter client that, in spite of its 1.0 version number, already sports a series of features most apps don’t have. It’s got Tapbots’ distinctive design style applied to every aspect of the interface, and whilst some may quickly dismiss it as a non-native, Android-like look, I think it’s beautiful. More importantly, Tweetbot comes to the iPad not to single-handedly reinvent Twitter clients and the entire Twitter ecosystem, but to provide a delightful experience optimized for the bigger screen. That’s not to say Tweetbot for iPad is a blown-up version of its iPhone counterpart – you’d be mistaken in thinking Tapbots simply took Tweetbot for iPhone and made its graphics bigger to fit the iPad. The two Tweetbots look similar to each other -- some of interface elements are used consistently across both devices -- but the experience offered by Tweetbot for iPad is uniquely built for a device that’s swiped, touched, and held in a different way than an iPhone. Those who use Tweetbot for iPhone will be instantly familiar with Tweetbot for iPad. In fact, I don’t think it’s necessary to go through the feature set of the app again as Tapbots managed to incorporate the same functionalities across the two platforms very cleverly: what the app does is the same, how it does it is different. I want to focus on how Tweetbot for iPad takes advantage of the features built by Tapbots to deliver the best Twitter experience on the iPad yet, rather than explain once again how you can turn a list into a timeline, or iOS 5 Twitter integration. From a feature checklist standpoint, Tweetbot for iPad bears great resemblance to Tweetbot 2.0 for iPhone, which we have reviewed earlier today. Like Twitterrific for iPad, Tweetbot takes a simple approach at displaying your Twitter timeline on the tablet’s bigger screen. Rather than trying to break taps on usernames, mentions, or links into multiple panels that some users might find distracting, Tweetbot presents a clean, full-screen timeline design that can fit more status updates than an iPhone at once, and doesn’t try to revolutionize the concept of vertically scrolling a list of messages and clicking on links. There are tabs for the various sections of Twitter – including some new stuff that Tapbots has prepared for this new Tweetbot release – but no panels for the actual interaction with content, meaning that tweet details, webpages, and conversations will load in full-screen in a single window, not a panel sliding into view. And here’s where Tweetbot for iPad reveals one of its little design touches that manages to greatly enhance usability: because the iPad’s screen is so big, forcing users to tap on a tiny Back button to load a previous level of navigation can be cumbersome. To solve the problem of a bigger screen with tiny navigation buttons, Tweetbot for iPad implements “smart gestures” in the same way that the iPhone version allows you to quickly load replies and conversations with a quick swipe, only adding new actions for going back one level or to the “root” of a section, such as your Mentions. Typically, when I’m sitting down with my iPad and fire up Twitter I like to explore around, engage in conversations and look up other people’s tweets. It’s not like I’m always in my timeline: I might open a link or two, load a conversation and follow a user’s profile from there – “nested views”, as they should be properly called, are frequent and they must be considered carefully from a usability standpoint as the app should always provide the user with an easily understable way to go back. 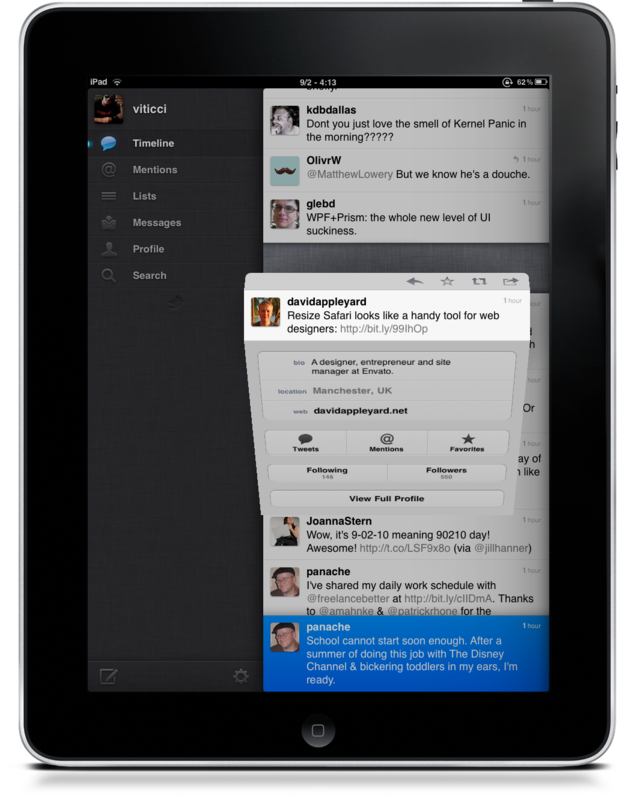 Tweetbot for iPad offers three: the Back button, tabs, and swipe gestures. Let’s say you’ve opened a conversation from your timeline, a user’s profile from that conversation (double-tap on avatar), and another conversation from the profile (swipe on a reply). Now, it’s likely that you’ll want to go back to Point A (your main timeline), or Point B (the conversation). Tweetbot offers a two-finger swipe gesture to go back one level, and three-finger swipe to go back to root. These gestures work amazingly well in any context, and they performed fluidly on my iPad 2 in any possible scenario. Of course, you can also use the aforementioned tabs and Back button to navigate if you don’t feel comfortable with gestures: whilst simply tapping Back will “go back” one level, a tap & hold on the same button will go back to the root of a view; similarly, tapping a tab in the sidebar -- whether it’s in portrait or landscape mode -- will always go back to the root. Tweetbot for iPad introduces a new option in Navigation settings that lets you hide tabs you don't want, so make sure to keep the ones you think you're going to use as a way to navigate back in the timeline. As for URLs: they open in full-screen mode à la Twitterrific and feature the same options seen in Tweetbot 2.0 for iPhone, new mobilizer command included (plus, they are colored and single-tappable). From a web view, you can take a look at Tapbots’ custom popover menu design by tapping on the Sharing button in the upper right corner. 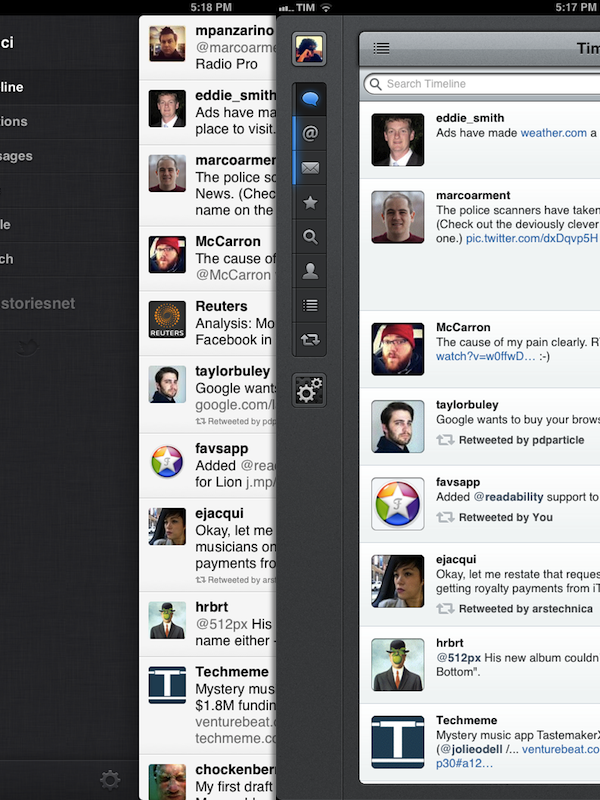 Timelines: Tweetbot for iPad (right) offers font size controls and bigger profile pictures than Twitter for iPad (left). Because the iPad’s screen is so big compared to an iPhone, some areas of Tweetbot might appear to be “wasting space” when there's nothing left to load – for instance, a conversation of only two tweets won’t even fill half of the screen in portrait mode. In testing the Tweetbot beta, I initially didn’t appreciate the choice of loading short conversations in their own dedicated view, because the rest of the window looked empty; with time though, I have developed a habit of using this empty space as a gesture area for navigation – it almost seems meant to be used that way. Otherwise, I don’t have a problem with Tweetbot using the same timeline design of the iPhone app as long as more tweets are displayed – reinventing the wheel (in this case, the timeline design) is not necessary when you just want to focus on reading status updates. Last, you can configure triple-taps in Settings for: Reply, Retweet, Favorite, Translate, or View in Favstar. Support for gestures, tap actions, and a variety of different web services is essentially the reason why Tweetbot is so highly regarded as an app for power users; Tweetbot for iPad doesn’t disappoint with a large selection of preferences and services to adjust and activate in the Settings. As on the iPhone, these options include Pinboard and Instapaper integration, support for upload services such as CloudApp and Moby, and mobilizer tools like Google and Readability. I particularly like how Tapbots figured out a way to implement a lot of settings and gestures without overwhelming the user experience. Going through all my settings for a newly added account takes only a couple of minutes (you’ll find some new options in Tweetbot 2.0 and Tweetbot for iPad, like a switch to make the new tweets bar persistent or invisible on scroll), and the Welcome screen should get you up to speed on the most important gestures in no time. I should also note that a kind of gesture Twitter for iPad implemented directly on the timeline, pinch to reveal tweet, is nowhere to be seen in Tweetbot, with Tapbots opting for more intuitive taps and swipes throughout the whole app. I think it’s a good choice. Tweetbot is the best Twitter client I’ve ever used on the iPad for a number of reasons. I’ve already mentioned gestures, user interface design, and integration with many different services I use on a daily basis. Next on the list would certainly be fluidity and timeline gaps – two aspects I expect to find fully functional and stable in the Twitter client I want to use every day. In spite of its custom UI, I didn’t find Tweetbot for iPad to be “heavy”. Whilst some people are firmly convinced Tweetbot is a “heavy app”, I think such purported “heaviness” can be subjective in terms of visual appearance, because as far as the engine that powers scrolling and animations goes, Tweetbot is extremely snappy and fluid both on my iPhone 4S and iPad 2. The beefy A5 processor certainly helps in getting views to load quickly and a timeline with hundreds of tweets to scroll fast, and I’ll admit I haven’t tested Tweetbot on the original iPad, but I’m also fairly certain a lot of optimization was done on Tapbots’ side to make sure Tweetbot’s custom graphics wouldn’t interfere in any way with the UX. My coworkers often make fun of me because I’m always on Twitter. As I have written elsewhere, Twitter has become more than a simple social network for me – it’s a people network that helps me connect with amazing individuals for work, discussion, or pure leisure. You see, I need a Twitter client that’s capable of loading several hours of tweets with hundreds of status updates when I wake up. I need it to be fast at fetching these updates and stable at scrolling through them as I catch up with the news; I need it to be able to go back even 20 hours if I need to read older articles, and I want it to feature state-of-the-art timeline gap detection that picks up right where I left off, no matter how far in the timeline it is. Fortunately, Tweetbot nears perfection with its implementation of timeline gap that puts the competition to shame when it comes to loading past tweets while maintaining your previous position in the timeline intact. Twitter and Twitterrific never quite got gap detection rigt, and I’m glad this functionality of Tweetbot for iPhone has been ported over to the iPad. With the new tweets bar (which is dark gray on iPad), you also have a nice way to see how manu unread tweets you have while scrolling. As I said above, Tweetbot for iPad shares the same UI principles and feature set of Tweetbot for iPhone, but there are many things that are unique to it, especially in the interface design department, given the different screen real estate Tapbots had to work around. Several views aren’t simply bigger, as the timeline could suggest, they are different. Take the user profile view for example: rather than placing a single user’s stream in a tab separate from the profile page, Tapbots is integrating tweets directly below the profile with a tabbed interface. In the upper section of the view, you can check out various information such as following and followers count, bio, web link, and other data. There’s also a Follow button in the upper right corner, and the usual action icon will let you message people, mute them, or add them to a list. The profile view opens with the Tweets tab directly selected, so you’ll see a portion of a user’s tweets below the initial user info box. But as you scroll these tweets, the tabs will snap back to the top of the timeline so they will “stick” as you scroll, allowing you to easily switch between Tweets, Mentions, Favorites, and Lists. The effect is really neat, helps saving taps and precious interface space, and you should see it in action. As with the iPhone app, Tweetbot for iPad has solid list support with creation, management and deleting features built-in. You can create new lists on-device, manage users inside those lists, and subscribe to other people’s lists without leaving the app. And of course, you can make a list Tweetbot’s main timeline, which is another characteristic feature of the app iPhone users will immediately recognize. Tweet Marker support, which was initially added to Tweetbot for iPhone, plays a big role in this iPad version if you own multiple iOS devices running Tweetbot, or a Mac with a Twitter client that has Tweet Marker sync. Now, the timeline position that the service saved from your iPhone’s Tweetbot will be pushed to the iPad automatically (if you activate Tweet Marker) every time you launch the app. I have tested Tweet Marker pretty heavily (I use it every day), and Tapbots’ implementation is flawless: getting the last synced position takes less than a second, and the app is capable of automatically scrolling to the last tweet you saw or mention you were about to reply to. We have covered Tweet Marker support in Tweetbot before, and those who were waiting for cross iPad-iPhone compatibility in Tweetbot to start using Manton Reece’s service finally have a reason to. I should probably mention that one of the things Twitter for iPad did exceptionally well in my opinion was letting you load links in a separate panel and scroll the timeline at the same time. That was one of the most controversial features of Loren Brichter’s app (animations weren’t 100% smooth and the web panel could be lost by simply switching tabs), and I liked it a lot. Tweetbot doesn’t take the crazy-innovative approach of Twitter for iPad, but I haven’t found the absence of panel-based link opening to be a problem in daily usage. I did notice, though, that I’ve been marking a lot of tweets as Favorites lately, but I’m not sure that’s related to Tweetbot. Typically, I’d mention that a new app I am reviewing is pretty great, but has some flaws in its first version – which is completely normal. With Tweetbot, however, I tried to come up with things I didn’t like in my three week period of testing – which involved several days of using only an iPad and hours spent on Twitter – but couldn’t. Honestly, there’s nothing “I don’t like” about Tweetbot, just a few things I wish 1.0 already had, and that perhaps are coming in the future. Personally, I would like to finally be able to use both Pinboard and Instapaper as bookmarking services at once, and have some kind of Evernote integration for saving tweets and links. I also think it’d be neat to have real-time streaming for tweets, iCloud sync for settings, and an option to add tweets to Storify – even though I understand the latter may be asking too much. Like I said: I’m very happy with the workflow Tweetbot enables and I never found myself wishing a feature had been implemented differently. So here’s another possible scenario. Let’s continue to diversify the offer of available Twitter clients, and settle with one app for power users. Justin doesn’t like Tweetbot, but perhaps one year from now Tweetbot will be available on more platforms with changes and tweaks that everyone will like and use on a daily basis, even Justin. Around that Twitter client for power users, I imagine a flourishing ecosystem of innovative Twitter apps that don’t simply focus on building an alternative to Tweetbot — a daunting task at this point — but provide a unique experience that can live alongside the main, full-featured client. I’ve been using Tweetbot on my iPad for three weeks now, and it’s good. More than good, it’s the great Twitter client power users and those who simply didn’t like the alternatives out there were waiting for. Tweetbot doesn’t reinvent the genre and will look fairly familiar to those coming from the iPhone app; Tapbots brought the iPhone version's highly engaging experience and powerful features to the iPad, fine-tuning the interface and interaction for the bigger screen in the process. You have to despise Tapbots’ style to not like this app, as anyone who’s been around long enough in the industry can tell that, as a Twitter client, Tweetbot is an amazing achievement for its developers, and the third-party community as whole, which has now a new standard to be compared to. Tweetbot for iPad is available today at $2.99 on the App Store.